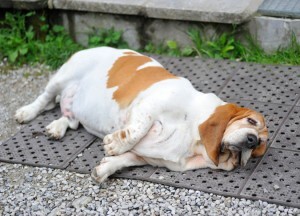 When it comes to canine obesity, sometimes the folks at Varsity Pets can get a little bogged-down in the minutiea. What’s the most effective regulatory regime for making Big Kibble tell the truth about the nutritional content of its products? What’s the target fat content of the optimal canine diet? How many calories should a 40-pound, intact, adult male canine athlete ingest each day? Interesting stuff, but sometimes a crisp, clear “big picture” statement is more powerful than dozens of little, detailed facts. For dogs in the United States today, moderate obesity is both more deadly than smoking and more common than Facebook. More deadly than smoking but more common than Facebook? No way, right? If you think we’re missing anything then please feel free to leave a comment and point it out. But it looks to pretty conclusive to us. Canine obesity really is more deadly than smoking and more common than Facebook. And when you’re confronted with facts like those, it’s pretty hard to deny that canine obesity is the single biggest public health crisis facing pets in the United States today. We lost out 12 year old dog to diabetes and probable cushings disease recently. She was a beautiful Irish Terrier that was with us from about 10 weeks old. Her illness may have been due to the underlying cushings but losin 5 lbs could have possibly given her a few more years of a healthy life. We have adopted 3 pound puppies now and I’m working to make sure they stay fit . I’m so sorry to hear that Karen. I hope that you’re staying strong and positive. An extra bonus of workplace smoking restrictions, other than protecting non-smokers, is that they may also encourage smokers to smoke less, or even quit. In nearly every case, the diseases in this second group were more likely to kill current smokers than nonsmokers, according to the study. Studies of mortality show that people over 90 who smoke have lower mortality than those over 90 who don t smoke.